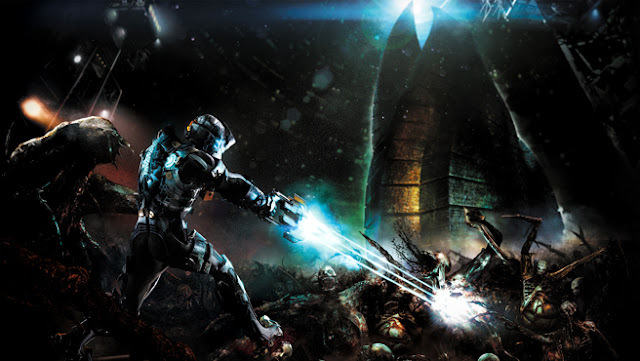 Apparently in space they can still hear Issac Newton scream..... fresh from my run through of the original Dead Space campaign (which despite taking a while to get going, I found it to be a strong gaming experience [He sees dead people! He's like that kid from The Sixth Sense!]) I thought I'd give the sequel ago. Waking in a hospital, strapped into a well tailored straight-jacket, I'm immeadiatley confronted with my apparent rescuer taking a bony arm to his eyeball, signalling the start of a frentic run through a hospital that's seemingly overun with the Necromorphs. Nice start Viceral Games! Early on it's clear the graphics in Dead Space 2 are much improved over the original game. It seems to move more fluidly and I like the new changes - the rig looks a little more friendly and I'm seeing and hearing hero Issac's face more. Add all this to some nice frights and well drawn bits and pieces, walls, furniture and fancy door locks, Dead Space 2 looks to be the money. What I'm loving 2 hours into the campaign is the destructible environment, new, scary monsters and even though it's still get from A to B and solve stuff along the way, that activity has been made less a chore. That happens when trains nearly land on top of you. There was a particular level where I was endlessly wandering around in a church and I was attacked by a group of very grumpy creatures that reminded me of Velociraptors. So I was extremely delighted after having slaughtered them when I earned and achievement called "Clever girls" which was a play on a scene from the film Jurrasic Park. Through out the game there was another 3 or so set pieces with these creatures and they were fantastically fun to tackle. The rest of Dead Space 2 is a nice jaunt through halls infested with various creepy crawlies. I love how the game's scripting has been improved so that the 'feats of engineering' that Issac is asked to do are not such the chore that the original game was. I already wrote that didn't I, because that's how happy I am about it. This game is not as scary as the original Dead Space. I think this is a factor of now that I'm playing the sequel, I know what the guts of the game are. Still, some of the sequences are pretty hair raising and there's nothing like a monster sneaking up on you from behind to get your spidey senses tingling. As a whole, the story of Dead Space 2 is interesting in that it delves a little more deeper into the fervent religion Unitology. It's this religion that drives the need for it's members to find the marker so it will take them to salvation. Much as Halo's Covenant were lead to believe firing the Halo Arrary would enable their Great Journey, Dead Space's Unitologists clearly believe the Marker is where it's at. As the hullicination of Nicole (remember her from the original game) helps and hinders you along, the story winds up quite nicely at a cross roads of sorts where plot elements from the original game come to another head. The Final Boss Battle is fairly weak and that impression is perhaps because of what happened to me when I first faced my nemesis who had plagued me the whole game. I started it with only one piece of ammunition! Overall, Dead Space 2 is more vastly polished than it's predecessor, has a good script and is very fun to play. I recommend you pick up a cheap second hand copy like I did and have a blast.